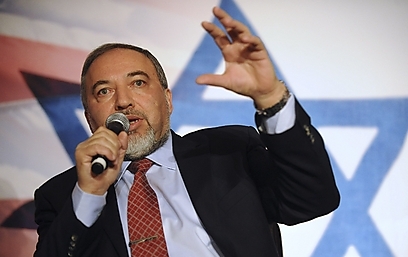 WASHINGTON - Foreign Minister Avigdor Lieberman stressed on Friday that the current Israeli government is committed to the two-state solution and is bound by agreements signed by previous administrations – even if it is unhappy with them. Lieberman made the remarks after Israel approved the construction of 3,000 additional housing units in Jerusalem and the West Bank, beyond the Green Line. Speaking at the Saban Forum in Washington, Lieberman said that the Jewish settlements are not the obstacle to peace, and went on to assert that the primary problem faced by the Palestinians and the Mideast is "poverty and misery." He further accused the Palestinian Authority's government of corruption. Lieberman suggested the Palestinians were solely to blame for the conflict, saying that they repeatedly rejected peace proposals brought forth by Israeli leaders. "We need some comprehensive solution with the Palestinians, but it depends first of all on the Palestinians," he said. "(…) The ball is in their court. We're ready to sacrifice, we're ready to understand, but we're not ready to be suicidal." Deflecting an accusation by the Egyptian ambassador to the US, Mohamed Tawfiq, who said the Israeli "occupation… throttles the Palestinian economy and makes it impossible to grow," Lieberman expressed hope Egypt would resolve its own problems. He then resumed to blaming Abbas for the breakdown in the peace process. "We're ready even today to resume the direct talks without any preconditions," said. "The one who did everything to avoid direct talks was Mahmoud Abbas. "(...) This Rightist government recognizes the two-state solution," Liebrman concluded. "We respect all obligations of the previous governments, even if we don't agree with them." See all talkbacks "FM: Abbas to blame for failure of peace talks"